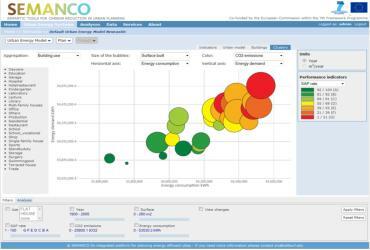 SEMANTIC TOOLS FOR CARBON REDUCTION IN URBAN PLANNING Co-funded by the European Commission within the 7th Framework Programme Platform The SEMANCO integrated platform provides access to widely dispersed energy related data about cities stored by many different organisations. In this way the project platform supports improved energy analysis based on the assessment of existing data rather than estimates. It does this using semantic data modelling that enables information stored in different formats and different places to be used to create a multi-level energy model of an urban area. That can be used to analyse the energy performance of buildings, neighbourhoods, districts and regions. Tools Benefits Manresa, Spain Some of the most relevant technological outputs of the project Integrated platform Deliverables Publications Wiki Case studies Ontology editor Ontology mapping tool Newcastle, United kingdom Copenhagen, Denmark Visit the blog The SEMANCO integrated platform has been developed for three cases of study. The data available in each area has been integrated using semantic technologies. Demonstration scenarios have been implemented in three cycles to test the functionalities of the platform's tools. The project activities at each case study are reported in the blogs.​ Project Outputs Recent news & events SEMANCO will be present at the 6th ECTP Conference in Brussels 2nd June 2014 SEMANCO will present a poster at the 6th European Construction Technology Platform conference that will take place in Brussels, from 17th to 19th June 2014. SEMANCO in Manresa local news 2nd June 2014 The local newspaper Regio7 from Manresa has informed about the workshop “Ciutat i Energia” organized by FORUM in Manresa on May 29th 2014. Ontology Data structuring for the ontological modelling of urban energy systems: The experience of the SEMANCO project 20th October 2014 The article, titled "Data structuring for the ontological modelling of urban energy systems: The experience of the SEMANCO project", will be published in "Sustainable Cities and Society". This article presents the methodology used to set up a vocabulary based on existing technical standards and structured in Energy Standard Tables, which constitute the base of the formally specified SEMANCO ontology. 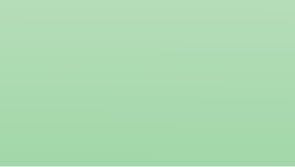 Newsletter n.6 has been published 29th October 2014 This Newsletter features: • Energy services web-portal • Finalisation of the SEMANCO platform • Dissemination and exploitation activities • Publications • Smart City Expo World Congress To find out more read it here. Smart City Expo World Congress 16-18th November 2014 SEMANCO will be present in the Smart City Expo World Congress that will take place in Barcelona, 16-18 November 2014. ​ Newsletter n.7 has been published January 2015 This Newsletter features: • EECITIES energy services provider • Open Source Outputs • Publications • Presentations • Contact To find out more read it here. EECITIES energy service provider Workshops SEMANCO ENDS / EECITIES STARTS March 2015 After more than three years of continuous and intensive work, the SEMANCO project has been successfully completed in February 2015. The project results have received the final qualification of “excellent” by the experts’ committee of the FP7 programme, as a recognition to “a research project that has fully achieved its objectives and technical goals and has even exceeded expectations”. The exploitation of the technologies developed by SEMANCO continues with the platform EECITIES. 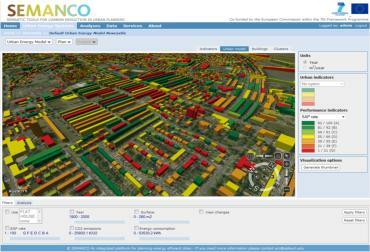 The SEMANCO platform includes a set of tools to visualise and analyse a city's energy data. The visualisation tools combine interactive 3d models, tables and diagrams to display energy related data. The analysis tools use data mining techniques to enable consultants, policy makers and planners to calculate energy performance indicators. These tools can be used to support informed public dialogues and decision making, based on a detailed analysis of many different possible options. 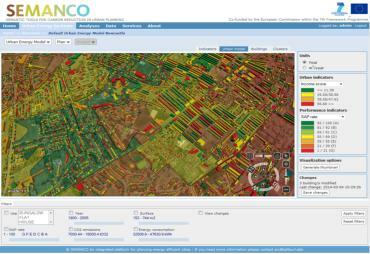 The open structure of the SEMANCO platform enables a city's energy model to be enhanced when new tools and/or data. This data may be generated by the platform tools or come from external data sources. For a given energy model, users can define their own key performance indicators. This combined with the open structure of the platform, offers the potential to adapt the services that provides to the needs of many clients, such as municipalities and city authorities, public and private development companies, financing institutions, public and private real estate companies, national and regional energy authorities, energy consultants and even national and European policy makers.